The color of ivory is relevant at all times. Fashion for tender milky-white shades does not pass with an endless succession of trend changes. The fact is that a noble and yet laconic shade of white color is relevant in any room – in the bedroom or living room, kitchen or hallway, in a nursery or bathroom. At the same time, it does not matter what style of design you choose – the ivory color will look organic both in the luxury of the classical environment and in the ultramodern variations of the design of living quarters. Another important advantage of ivory is associated with its compatibility – you can combine a noble shade with any colors – from gentle pastel tones to bright and dark shades. If you decide to use the color of ivory while designing the interior of any room of your home, then our impressive selection of 50 design projects of rooms with a variety of functional loads can inspire you. Before deciding of whether the ivory in your room will be a backdrop for brightly colored decisions or it must be combined with other colors from the palette of pastel shades, you need to understand the color itself. Only at first glance it may seem that the color of ivory is unambiguous. However, it has many shades. If we talk about the combination of ivory with wooden surfaces (or its spectacular imitation), then bleached oak is ideal for creating light, pastel images, and for contrasting interior design. The ivory can be effectively combined with dark walnut and wenge varieties. The main advantage of ivory lays in its unobtrusiveness. Whatever you use this color for interior decoration it will not bother you for many years. The color of ivory serves as an excellent background for bright or contrasting furnishings as wall decoration. It can be chosen in the form of a color for the execution of furniture (cabinet, upholstered) or decor, textile decoration of windows or a berth – much will depend on the encirclement of the ivory, its color companions. By itself, the shade is neutral, noble, capable of creating an easy relaxed atmosphere of the room which at the same time looks luxurious and fresh. The color of ivory as a background for the creation of the interior of the living room is suitable for conservative lovers of classics and those whose priorities are constant changing. For those people who want to often update the appearance of the home, place new accents. Ivory as the paint of the walls is suitable for any interior stylistic direction. Choose a durable ivory finishing material and you will need to only periodically change the color of the textile (curtains or sofa cushions), carpet or decorative elements to create a completely new mood and character of the living room. Milky-white shades look noble, but at the same time unobtrusively. But it is not worthwhile to perform the entire interior of the living room in light colors, even in a very modest room. Ivory perfectly combines with natural materials (or their analogues with a high level of imitation). Use dark wood for decorating floors or highlighting structural elements – door and window openers, interior doors or partitions, ceiling beams, skirting boards and moldings. 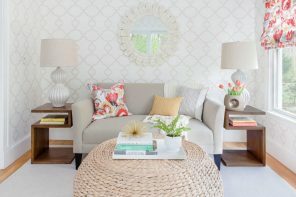 Another way to add brightness to the interior, where the finish of the main surfaces is made in ivory, is upholstery of soft furniture or colorful decorative pillows. In case the seating area of ​​the living room is represented by a large corner sofa or in addition to an ordinary sofa there are a couple of chairs then they will have a big impact on the formation of the color palette of the room. The palette of ivory shades is excellent for those who are not yet sure of their design abilities, especially the ability to harmoniously select the tones and their combinations. By choosing the color of ivory as the main background for the living room and choosing neutral colors for furniture and decor, you will never lose it. Calm and balanced design will be durable and relevant. Let no one call this drawing room creative or bold in design, but the main thing is that it is comfortable for everyone – the color palette does not tire, bright and colorful combinations do not excite the nervous system, allowing you to relax from the city noise and advertising illuminations. In the bedroom, where the main goal of the majority of the owners is to create the most relaxing atmosphere, ivory will be more than appropriate. It is great for finishing surfaces of walls or ceiling. Against this backdrop, it is easy to make the central piece of furniture (a bed) the main interior element. Even the soft shades of textiles as the decoration of windows and bed will look accentuated. 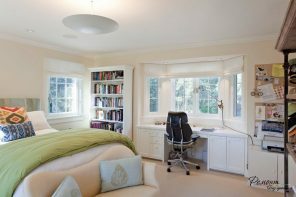 If you are afraid to overdo with light shades so that the bedroom does not turn into one solid foggy spot without clear boundaries and dark inlays to focus the look, use the color in the elements that are easiest to replace – the textile design of the sleeper and the window openings. If your bedroom has a sufficient area and a large window (and, perhaps, there are more than one), then you can use deep dark shades to combine with the ivory. The contrasting interior looks respectable and modern at the same time. Saturated colors perfectly set off a noble milky-white shade, giving the entire room a touch of refinement and luxury even with the most modest choice of furniture and decoration. The color of ivory is an excellent background for any bright elements. But also it is good as a companion for creating accent surfaces too. In the bedroom, such a surface is most often the wall behind the head of the bed. Both the interior of the room can be diversified and you will not have a bright spot in front of your eyes that interferes with relaxation and falling asleep. If your bedroom is located on the south or south-west side of the building and most of the time the room is well illuminated by the sun’s rays, then the combination of ivory and light blue tones is perfect for decorating the walls. It can be both pure blue color, and a gentle shade with an admixture of gray. 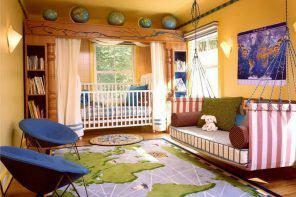 It all depends on the size of the room and the shade of milky white, which can be present on the ceiling, partly on the walls, emphasize the main tone, and also be the color of furniture, textiles. The kitchen area of ​​ivory looks not just light, but sterile clean, fresh and even weightless. Considering that the main color of the kitchen is determined by the shade of the facades occupying most of the space, the selection of the ivory for the execution of the furniture set becomes decisive in the formation of a bright image of the room. 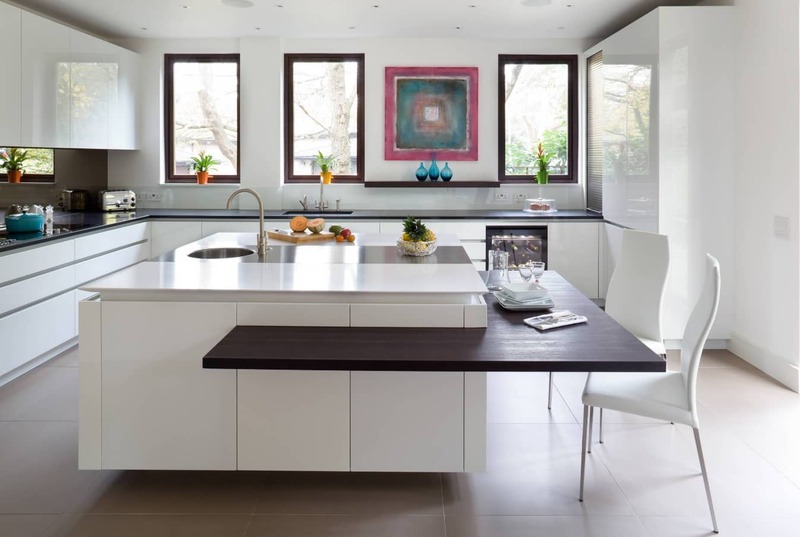 The kitchen looks noble and luxurious, regardless of whether you have chosen a modern style of smooth facades or the classic execution of doors for storage systems with respective design of the entire room. In order to shade the noble milky-white shades of ivory, the dark execution of the kitchen countertops is perfect. Wenge or walnut can be used to create island countertops or bar counter, as well as the entire lower tier of kitchen cabinets. The entire dining group or just the table or chairs in the dining area can be performed of ​​these dark wood sorts. The opposite approach is related with the fact that the color of the ivory in the kitchen with the dark or bright facades of the cabinets should be dosed. 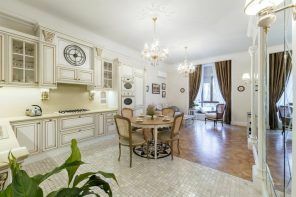 In this case, ivory can be used for the execution of table tops or a dining table, the facade of a kitchen island or a peninsula and, of course, as a background for a furniture ensemble – the decoration of walls, ceiling and even a backsplash. In the spacious kitchen, you can use a rich color finish in order to emphasize the nobility of milky white shades of ivory. Some contrast will only benefit the image of the room. The bathroom in milky-white colors is a symbol of cleanliness and freshness, nobility and luxury. In a small room for water procedures, the color of the ivory helps to visually increase the space. In a large sized bathroom, the ivory will help creating a truly aristocratic look of an incredibly comfortable room with a relaxing atmosphere. If the ivory is used as the color of the walls, then for the floor covering it is better to choose a darker tile and the dark wood trimmed facades of the storage systems (vanity under the sink). But in some cases the ivory is used almost entirely: mainly for the design of small utilitarian spaces. If the area of ​​the bathroom allows, you can use the reverse contrast combination: choose dark or saturated bright color of the walls, and finish the ceiling and the floor in one of the shades of ivory.